This cashew chicken is chunks of crispy chicken and roasted cashews tossed in a sweet and savory sauce. Serve over rice for the perfect easy dinner option! I always order cashew chicken from my favorite take out spot, and I think this homemade version tastes even better than the restaurant recipe. Serve with rice and vegetables for a complete meal. I always order cashew chicken from my local restaurant, but this homemade version is even better than the take out kind! It’s got plenty of breaded chicken with crunchy cashews and the most delicious (and easy) sauce. How do you make cashew chicken? The first step in this recipe is to cook your chicken. The chicken is coated in cornstarch and pan fried until crisp. After the chicken is done, it’s tossed in a 5 minute sauce that contains ingredients you probably already have on hand. I add the cashews at the very end of the cooking process because I like for them to retain their crunch. If you prefer softer cashews, you can simmer them in the sauce for a few minutes before you add the chicken back to the pan. 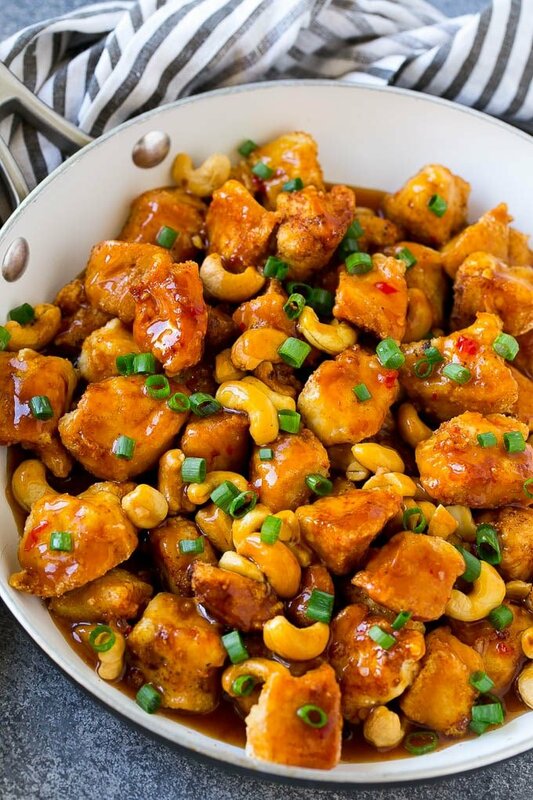 What sauce is in cashew chicken? Cashew chicken comes in a few different varieties, the most common types being Chinese cashew chicken and Thai cashew chicken. The Chinese version of cashew chicken tends to include sauteed chicken which is tossed with vegetables and cashews in a brown sauce. This version veers more towards the Thai end of the cashew chicken spectrum with the breaded chicken pieces and sweet and savory sauce. The one ingredient you may not have on hand for this recipe is the Thai sweet chili sauce. This is a reddish colored condiment sold in a glass bottle in the ethnic foods aisle of most grocery stores. It’s not particularly spicy but does add a ton of flavor to this dish. 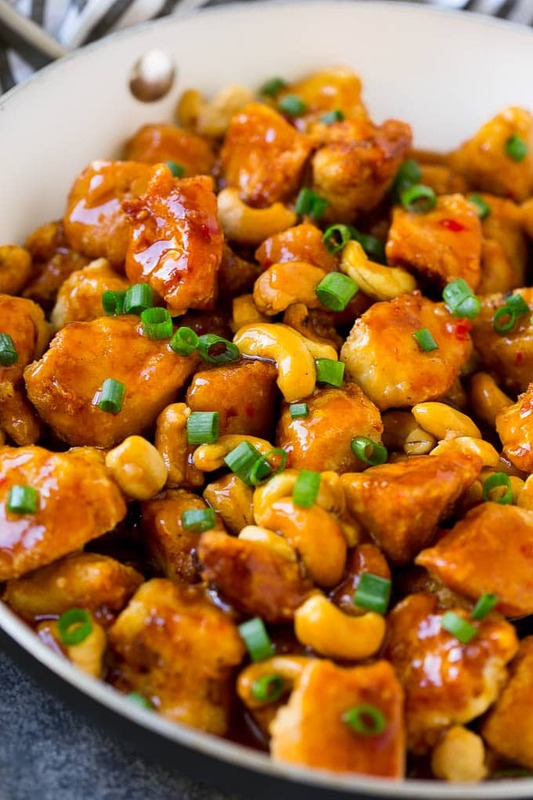 This cashew chicken can be made in the slow cooker if you’d prefer to go that route. Simply bread and saute your chicken, then toss it with the sauce ingredients in the slow cook and cook on high for 2 hours or low for 4 hours. 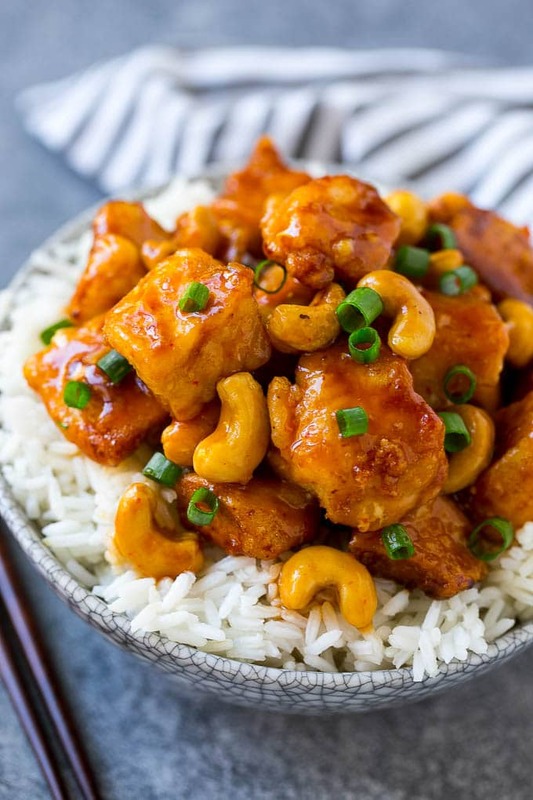 Cashew chicken is not the healthiest choice, because the chicken is cooked in oil and cashews tend to be higher in calories, although they do contain some health benefits. If you’re looking for a healthier version of cashew chicken, skip the breading and simply saute the chicken in a bit of oil, and reduce the amount of cashews by half. I typically serve cashew chicken over steamed rice, but it’s also great with noodles, quinoa or zucchini noodles. No need to order take out when you can make your favorite restaurant dishes in the comfort of your own home! 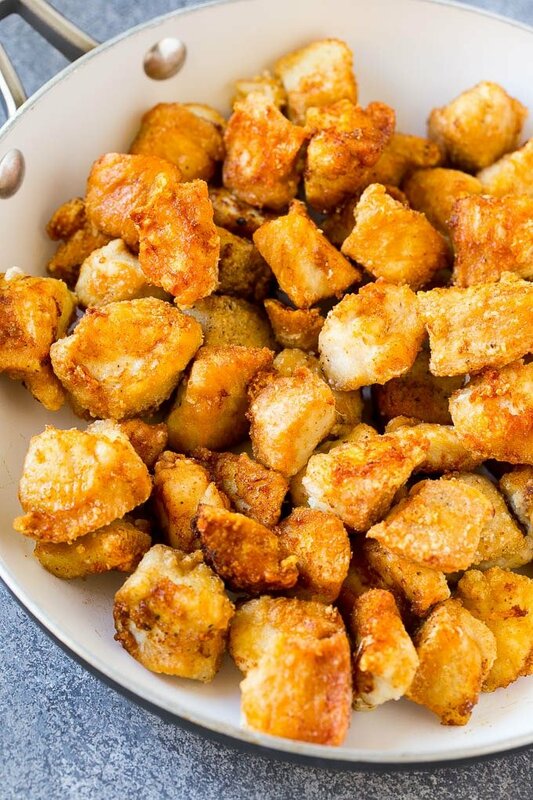 Place the chicken in a bowl with 1/4 cup cornstarch and salt and pepper. Toss to coat chicken evenly. Heat the vegetable oil in a large pan over medium high heat. Add half of the chicken in a single layer. Cook for 3-4 minutes per side or until browned. Transfer the cooked chicken to a plate and repeat the process with the remaining raw chicken pieces. Remove all the chicken from the pan. Drain any excess oil, leaving 1 teaspoon of oil in the pan. Add the garlic and ginger and cook for 30 seconds. In a bowl, whisk together the chicken broth, soy sauce, rice vinegar, ketchup, sweet chili sauce and brown sugar. Pour the sauce mixture into the pan. Bring the sauce to a simmer. Place the cornstarch in a bowl with 2 tablespoons cold water and whisk to combine. Pour the cornstarch into the pan and bring to a boil. Cook for 1 minute or until sauce has just thickened. 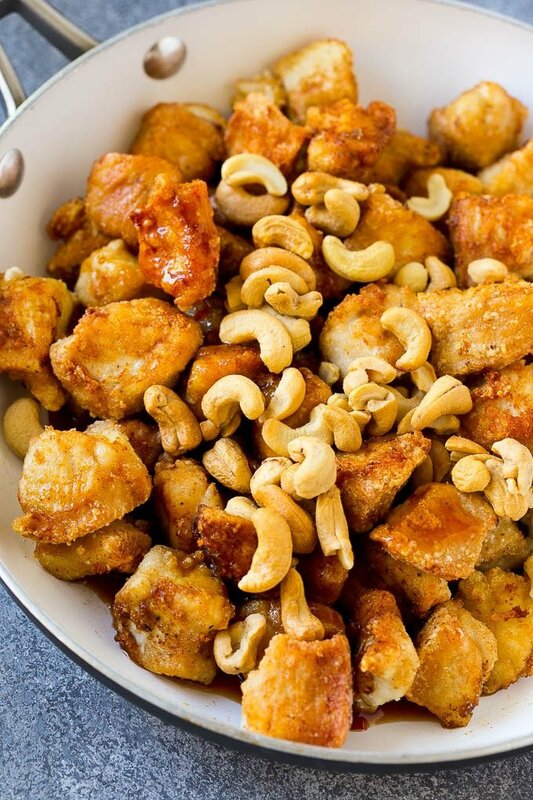 Place the chicken and cashews in the pan and toss to coat with the sauce. Sprinkle with green onions and serve. Do you not dip the cornstarch covered chicken pieces in egg before frying? I don’t for this recipe, but you can if you prefer! 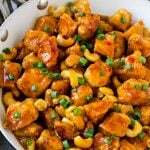 Cashew chicken is my favorite to make for the family. It’s been awhile since I’ve done it, I may try this one out on Sunday when the grown kids are here to visit. Sounds like an interesting meal. I never thought to pair meat with nuts before. So different! Oh, my this looks yummy! Finally a nutty chicken recipe, I can try. I’m allergic to almonds and peanuts, so I can definitely give this a try! Thanks for sharing! What an interesting combination for a dish. I love the idea of nuts with my chicken. I bet it’s delicious. I love cashews and I definitely love chicken so this is really appetizing for me. Thank you for thsi mouthwatering and delicious recipe! This cashew chicken actually looks better than ordering it from the restaurant. Wow what a wonderful and delicious looking dish. I will definitely put this one my filafax for next chicken dish for family and friends. Cashew chicken is my favorite takeout. Can’t wait to try it! Ha! And I was hesitating what to make for dinner! not any more:) Instead of chicken I’ll use tofu though – thanks! My mouth is watering! I’ll have to try this sometime, the flavors look delicious. Mmmm I’m drooling! 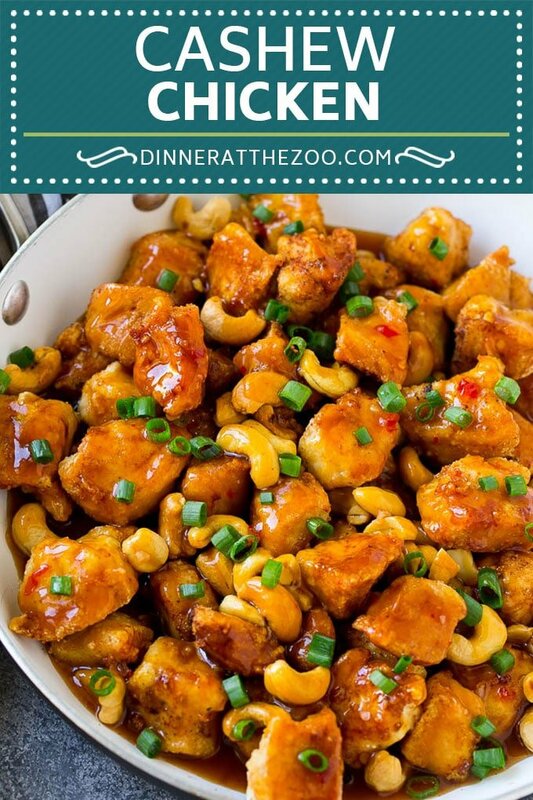 This cashew chicken looks soooo delicious! I will try making this at home. I have to make this. Cashews are my favorite nut, and I love all the flavors here. Even the colors are wonderful. Do you ever have Instant Pot Recipes? Or even Power airfyer oven(as seen on TV that is fryer, dehydrated and a Rotisserie oven all in 1) Recipes? 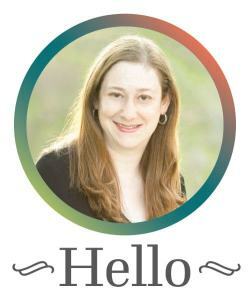 Yes, I’ve been working on quite a few Instant Pot recipes that I’ll be releasing soon!